Improve handling in a few hours with Eibach! 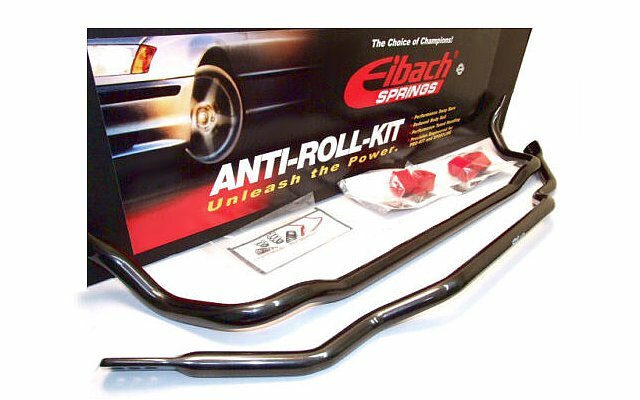 Eibach's E39 Anti-Roll Kits reduce body roll through increased design stiffness over the factory’s sway bars. The result: improved handling poise and increased cornering grip in any performance-driving situation, weather headed to the grocery store or during a track day. These sway bars have little effect on the ride quality of your 5 series so other occupants in the car won't have any complains about ride quality. Manufactured from the finest US-made cold formed, high strength steel, and finished with a long-lasting red powder coat finish. UPDATE: We have confirmed that these sway bars also fit the 6cyl Wagon/ Touring models with no modification and work excellent! We have fitted to models with self leveling suspension as well as one fitted with KW coilovers. Both owners report vast handling improvements and no problems. We suspect that these were simply never tested by Eibach to confirm fitment on Touring and self leveling models, and were not advertized as fitting such. Questions? We welcome you call or email us for your no-pressure chat with one of our suspension setup gurus.